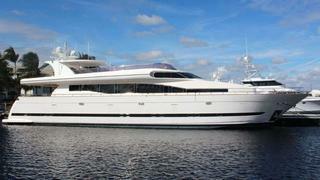 News in overnight from 26 North Yachts that they've listed the 32m motor yacht Mr Cat for sale. A semi-displacement motor yacht, Mr Cat was built by Horizon Yachts in 2002 to a design by Tomasso Spadolini and has a custom interior by Evan K. Marshall with marble flooring throughout. A large saloon has a bar and a dining table for 10 guests and comes with a television and surround sound stereo by Bang & Olufsen. Accommodation is for 10 guests in five staterooms. The master suite is on the main deck and has a king size bed, desk, pop up television and an overhead skylight while the VIP stateroom comes with a queen size bed, large wardrobe and entertainment system. There is a further double with a queen size bed and two twin cabins. All staterooms have television screens, Yamaha entertainment systems and en suite bathroom facilities. Lying in Fort Lauderdale, Florida, Mr Cat is asking $3,495,000.